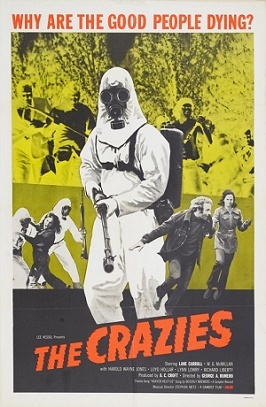 The Crazies has all the great elements you’d expect from George Romero. It’s a bio-hazard film, wherein an experimental “vaccine” is accidentally released into a town’s water supply when a military plane crashes. And wouldn’t you know it? Why, it’s not a vaccine at all, but a secret bit of bio-weaponry. Some of the townsfolk are resistant — to being quarantined that is, not to the bug. When you have rural USA, there are bound to be guns. So when a government edict goes out to round up the populace and stuff them in the school gym, well…that goes over like a lead balloon. And people fight back. Will government researchers be able to find a cure in time? Will our resistance fighter heroes survive the pathogen, and friendly fire? These and many other questions answered in our podcast of The Crazies.